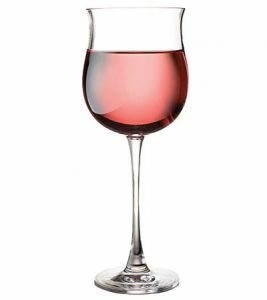 Be ready to serve all of your party guests with our guide to the Best Wines Under $15 for the Holidays! We get a ton of questions here at Garnish with Lemon about what wine to serve with a particular recipe. Sommeliers we are NOT, but we do know a thing or two about crowd-pleasing wines for a reasonable price. 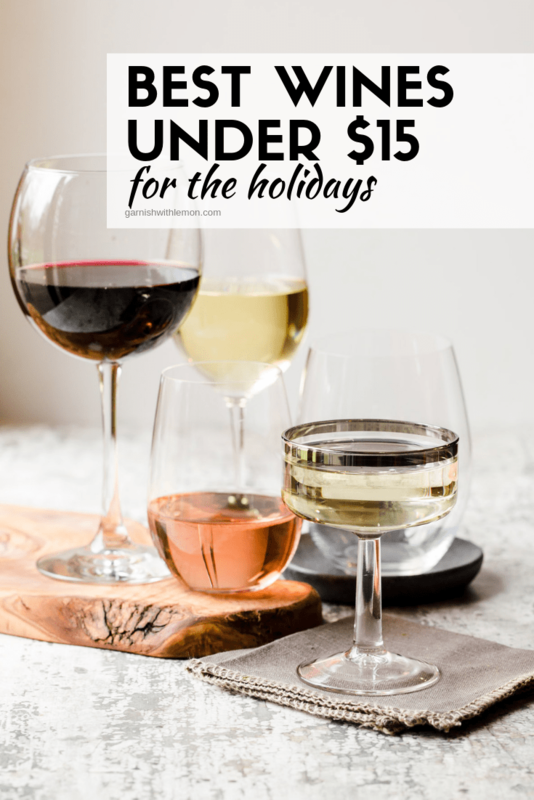 In this installment of Stock Your Home Bar, we’re sharing our thoughts on the Best Wines Under $15 for the Holidays. These wines – red, white, and bubbly – are what we have on hand when entertaining. All delicious, all readily available and all $15 or under. Nothing says “let’s get this party started” like a glass of bubbly! There are lots of different sparkling wines to choose from, but we find that Prosecco makes its way into our cart the most often. Lighter and slightly sweeter than a champagne, this Italian bubbly is most often recognized when paired with peach juice for a bellini, but it’s equally delicious sipped all on its own. Pairs well with Prosciutto and Melon Skewers. This is not your mama’s White Zinfandel, folks. Rosé comes in a rainbow assortment of pink shades and gives off a young, fun, lighthearted vibe. Extremely food friendly, it’s a great option for a diverse group of guests. Pairs well with Pesto Bites. Crisp and fruit forward flavors make Sauvignon Blanc a preferred white wine choice for many people. Options abound for this wine with popular, budget-friendly choices available from both domestic producers and New Zealand. Pairs well with Apple Bacon Bites. One of the most popular white wines in the world, Chardonnay is must have beverage in any home bar. It’s also one of the few white wines that can be successfully aged, so look for oaked or unoaked varietals in stores. Pairs well with Monterey Jack Quesadillas with Pear Salsa. Cabernet is a full-bodied red wine known for its tannins, fruit flavors and deep, gorgeous red color. With a high alcohol content and bold flavor, serve your Cabernet with a generous assortment of appetizers to best complement the wine. Pairs well with Crostini with Savory Tomato, Bacon and Apple Jam. Pairs well with Cherry Chipotle Barbecue Meatballs.